These two aren't completely done but I did finish all the machine work on them. 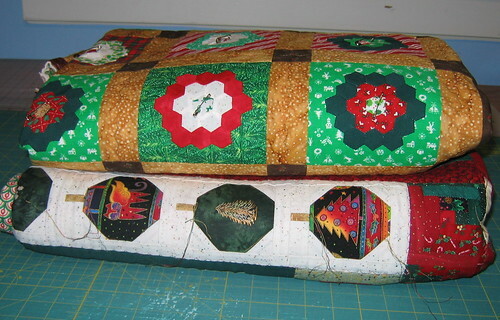 They are both Christmas quilts - my border round robin quilt and the grandmother's flower garden applique quilt. I now need to get the handsewing done on the bindings, some hand-quilting done on each and get all the thread ends tucked in. I think they will both be getting some buttons sewn on also. They both turned out pretty well I think. I have had the grandson here all week so it is pretty amazing that I have gotten anything done around here, but besides the quilting I have also cooked up all the wind-fall apples into applesauce, made bread, run errands, sorted out the Pampered Chef products from my party (we are going to deliver some of them today), moved some sod, and, last, but not least, maintained my sanity! We are having a lot of fun with our little guy but he does keep you going! Today I need to get my sewing room cleaned up and tomorrow we will clean the rest of the house in preparation for the first of our company arriving tomorrow. More will arrive Saturday and we will have additional guests for dinner on Sunday. It will be a busy week or so! When all the guests are gone I will be getting things packed up for my quilt retreat and after that I will be working for two weeks at our church while our secretary recovers from back surgery. That brings us up to Halloween and I think I will be heading to my sister's then for the reveal of the round robin block exchange I have been a part of.